Can A Governor’s Bank Account Be Frozen? 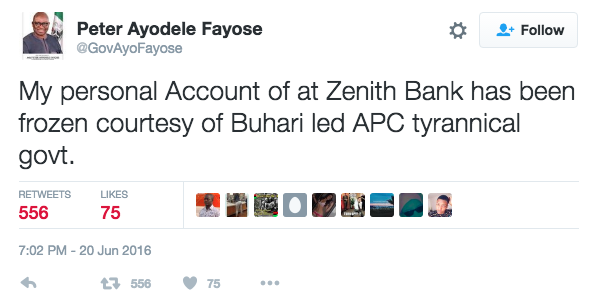 The EFCC has apparently frozen the Zenith Bank Account of the Ekiti State Governor, Ayodele Fayose. Since the news broke, debate has raged on whether or not the action is legal, given the provisions of our constitution on immunity for certain persons. First of all, some non-controversial stuff. 1(1) – This Constitution is supreme and its provisions shall have binding force on all authorities and persons throughout the Federal Republic of Nigeria. 1(3) – If any other law is inconsistent with the provisions of this constitution, this constitution shall prevail, and that other law shall to the extent of the inconsistency be void. “(1)(a)No civil or criminal proceedings shall be instituted against a person or continued against a person to whom this section applies during his period of office. “(1)(b)A person to whom this section applies shall not be arrested or imprisoned during that period either on pursuance of the process of any court or otherwise. “(1)(c) No process of any court requiring or compelling the appearance of a person to whom this section applies, shall be applied or issued. There’s a good account here of the case law that established that immunity from court proceedings isn’t immunity from investigation. It was the celebrated case of Fawehinmi v. Inspector General of Police (2002) 7 NWLR (Pt.767) 606, where the plaintiff sought an order compelling the defendant to investigate the governor of Lagos. The review has an interesting excerpt and I recommend the piece to the extent that it establishes that the immunity clauses of the constitution do not preclude investigations. i. Freezing Order. The procedure outlined for the EFCC here is to seek an order, via ex-parte injunction, permitting them to serve Form B on a financial institution. In making its application to the court to freeze the bank account of a sitting governor, the governor would have to be named in the court process as the Respondent. Can a sitting governor with immunity under the constitution be properly named in his personal capacity in any such proceedings? To put the question in a different way, if no proceedings can be brought in which a person enjoying immunity is a party, how can an order be validly sought and given under such proceedings? ii. The nature of exparte injunctions. It is always helpful to go back to the philosophical basis of legal doctrines and tools. One of the pillars of justice is that both sides of a case must be heard prior to judgement. However, in cases where there is a real urgency (either of preserving a right or preventing a breach), one side may in the absence of the other (exparte) apply to the court to grant an injunction preventing an act. Exparte injunctions are “interim” orders granted pending the determination of a motion on notice, where both parties argue the particular issue (different from an “interlocutory” order, where a situation preserved until the substantive suit is concluded). In the normal course of an exparte application, the appearance and participation of the respondent is both contemplated and required. Where the respondent is a governor with immunity privileges, it’s difficult to see the grounds for granting the order. iii. Criminal Proceedings vs Civil Proceedings. While it is clear that Governor Fayose can be investigated for any crime, it is clearer that he cannot be subject to any proceedings in court. If neither criminal nor civil proceedings can be instituted against him, or his appearance compelled by any process of court, it goes to no issue to try to argue that seeking a court order does not amount to starting criminal proceedings. It is true that proceedings are either civil or criminal, but if neither can be brought against him, it serves no purpose to suggest that the court order is one or the other. iv. Freezing Account =/= Investigation. We have established that the governor can be investigated. It has been argued by some that freezing his account is necessary to conduct the investigation. I do not think this is valid, for the following reasons — (i)fraud is proved by transactions, not the existence of a certain account balance. If Gov. X stole $20bn (America will know, mind you), put the money in his account and disburses it all before the EFCC shows up, does his empty bank balance absolve him? (ii) following from (i) the account does not need to be frozen for its history to be accessed or established. (iii) Governor Fayose is in office until 2018; is it the plan to freeze his accounts until then? As part of the ‘investigation’? Or as a prelude to trial? 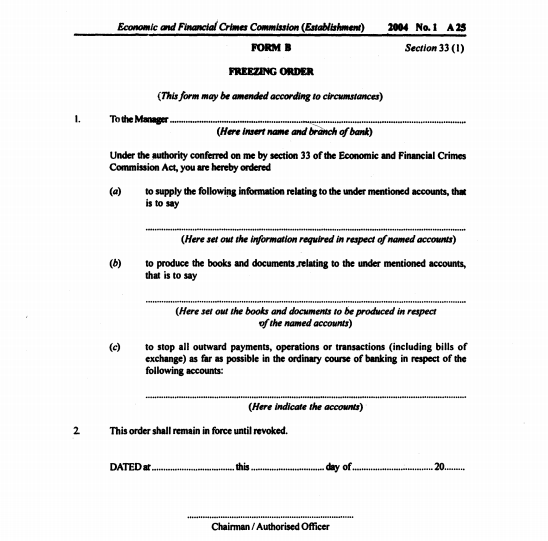 To conclude, it will probably need to be confirmed by a further decision of the courts (only because it’s not explicitly spelt out in black and white already) but as far as I can see, it is illegal to freeze a sitting governor’s account because the procedure for obtaining the order to effect a freeze is incompetent.